PharmAlliance 2005 Awards were announced on the occasion of Global PharmAlliance 2005 conference organised by Frost & Sullivan in Mumbai last week. The Partner of Choice 2005 awards were given to the Custom Research and Manufacturing Service providers (CRAMS) who have shown prominence in their respective categories. Partner of Choice for Drug Discovery in CNS was presented to Suven Life Sciences, Limited. Partner of Choice for Clinical Research went to iGATE Clinical Research International, Partner of Choice for BA/BE studies to Synchron Research Services Pvt. 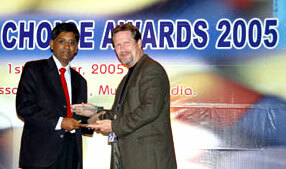 Limited and Partner of Choice for Corporate Excellence was given to Orchid Chemicals and Pharmaceuticals Limited. “These awards recognize the superior planning and execution of product launches, strategic alliances, distribution strategies, technological innovations, customer service and mergers & acquisitions. A host of other crucial arketing factors such as leadership, strategy, service, innovation, integration and development are also recognized. The companies that are commended as award recipients are those with the diligence, perseverance, and dedication required to develop a successful business plan and excel in the increasingly competitive global marketplace,” said Jayashri Kulkarni, Director, Health Care practice, Frost & Sullivan, India.